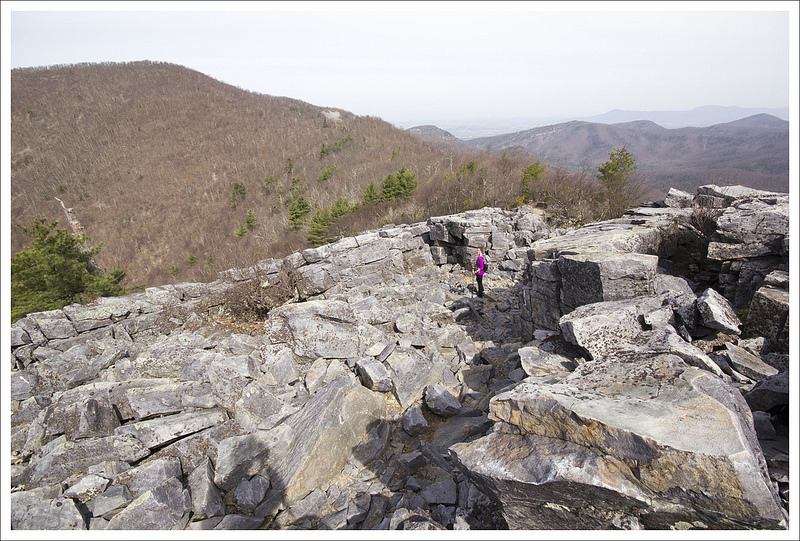 This 9.5 mile loop in the southern district of Shenandoah National Park offers vistas, streams and quite a bit of solitude! We think it would make a great short backpacking loop with a beautiful stream-side campsite along Paine Run. Adam Enjoys Blackrock summit. 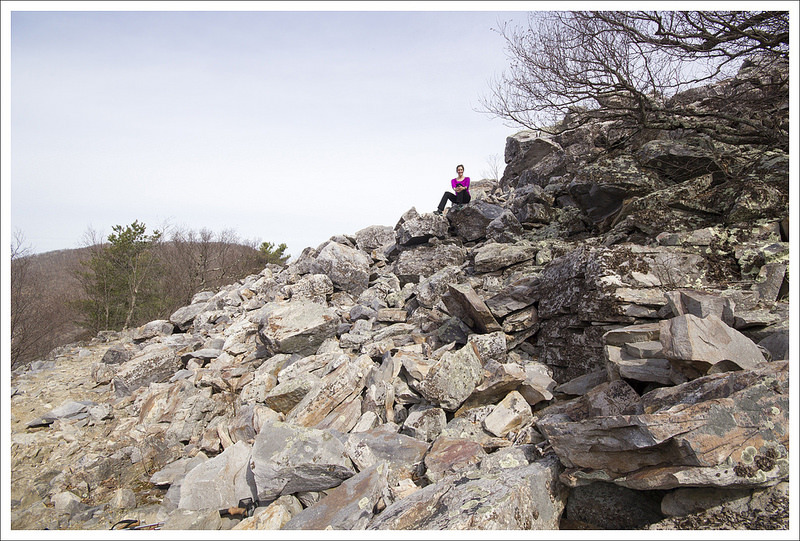 Below: Adam hikes the Appalachian Trail just north of Blackrock Gap; Christine climbs on the rock pile; Adam spots the spur trail that leads to the Trayfoot Mountain Trail. Every weekend this April has provided glorious hiking weather! I’m feeling so grateful that we’ve been able to get out so often and take full advantage of the warm, sunny days. 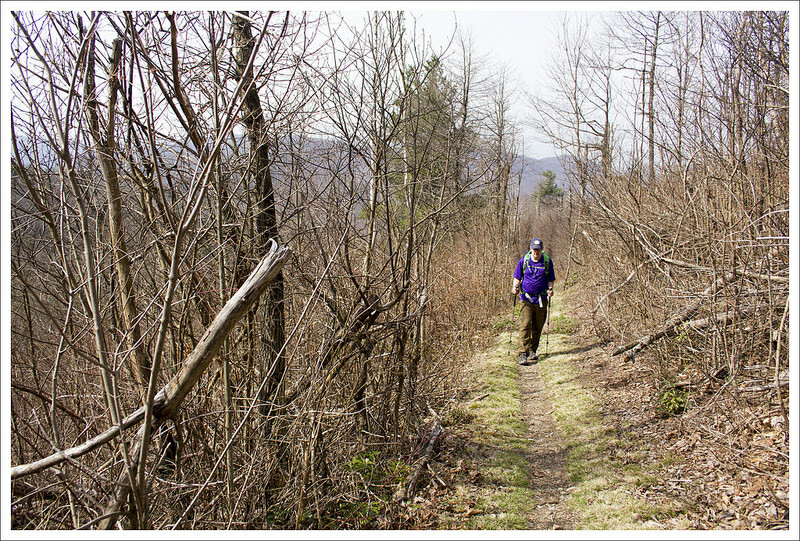 On the Saturday before Easter, we chose to hike the challenging 9.5 mile Trayfoot Mountain – Paine Run loop. This hike begins at the Blackrock Gap parking area (not to be confused with Blackrock summit parking). 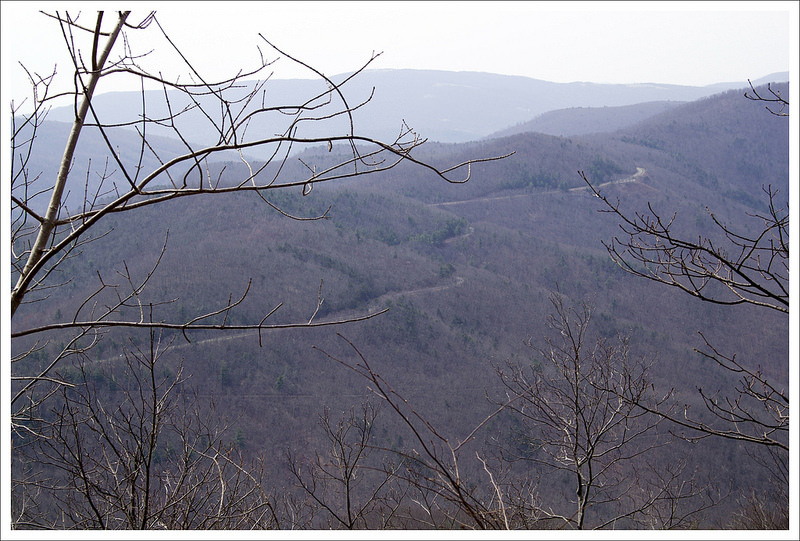 From the lot, cross to the eastern side of Skyline Drive and make your way north along the Appalachian Trail. After a couple tenths of a mile, the trail crosses back over the drive and heads steadily uphill for a little over a mile. As you climb, you’ll come to a junction – stay on the white-blazed AT, the turn to the right goes to the Blackrock shelter. At 1.3 miles into the hike, you’ll reach a cement marker for the Trayfoot Mountain Trail. Do NOT take this turn unless you want to miss the splendor that is Blackrock Summit! Continue another tenth of a mile to the massive jumble of boulders and jagged rocks that makes up this impressive summit viewpoint. We took some time to enjoy the views and climb on the rocks. The views from this spot are probably the best on the entire hike, although there are a couple more nice spots yet to come. 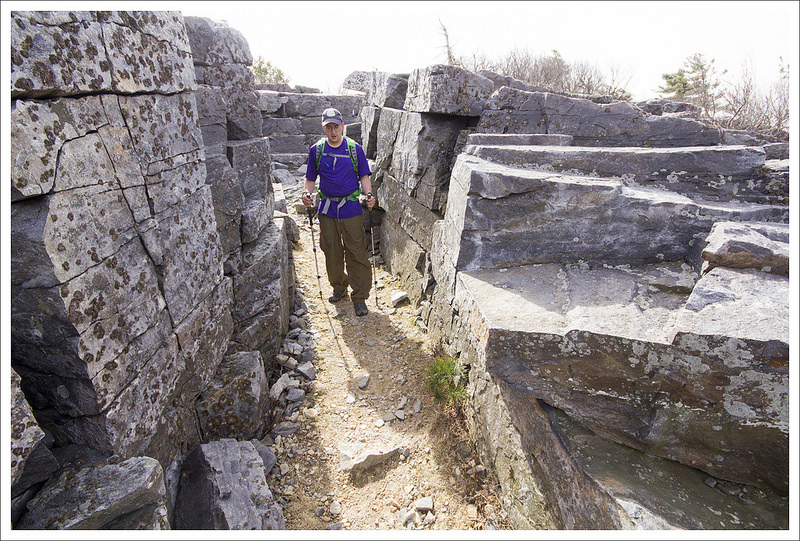 The trail passes through a corridor of rock. Below: Adam passes through the narrow opening; Climbing Trayfoot Mountain; From the ridgeline of Trayfoot there are several openings in the trees that give you views of a distant Skyline Drive. 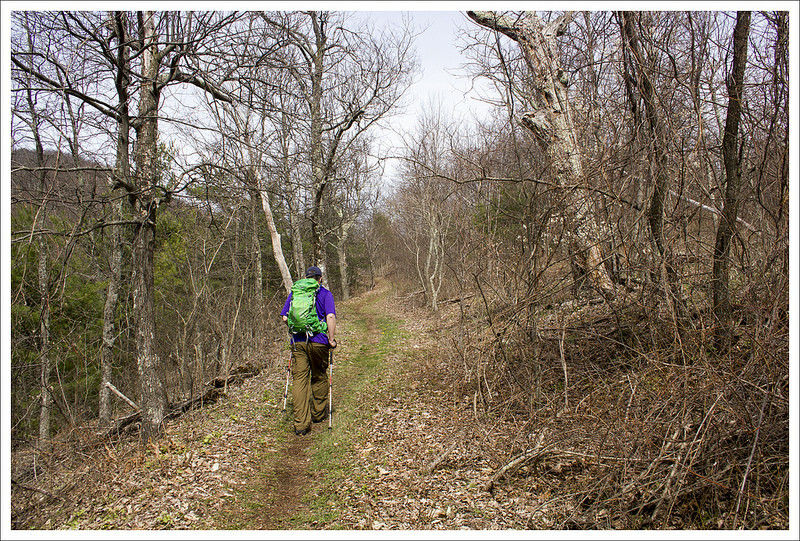 The Appalachian Trail skirts around the front edge of the summit before coming to a spur trail that leads down to the Trayfoot Mountain trail. The spur descends through a corridor of flat-sided slabs. When spur reaches the junction with the Trayfoot Mountain trail, turn right and follow the trail uphill along an old fire road. The uphill climb along this section is steady going! Near the top, you’ll pass another marker pointing toward the Furnace Mountain trail. Pass this and continue on the Trayfoot Trail until you reach the cement post marking the summit and high point of your hike. There are no views from this summit, but this starts the beginning of a lovely, easy ridge walk. The ridge rolls gently along, offering nice views of the Paine Run valley and a distant glimpse of Skyline Drive. The trail eventually begins a long gradual descent to Paine Run. 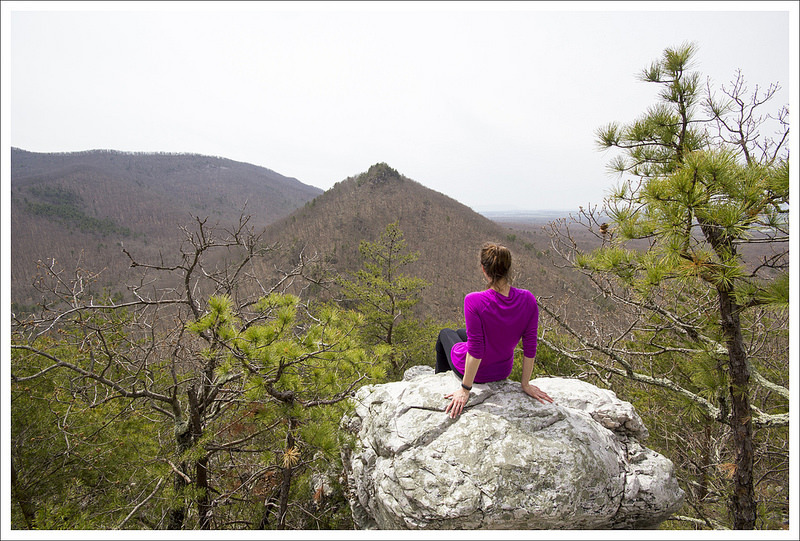 Your last sweeping vista on this hike comes at a pretty outcropping of rocks overlooking pointy Buzzard Rock. Switchbacks take you swiftly down to Paine Run. Near the first stream crossing, a cement marker points you left onto the yellow-blazed Paine Run Trail, which is essentially an old roadbed. 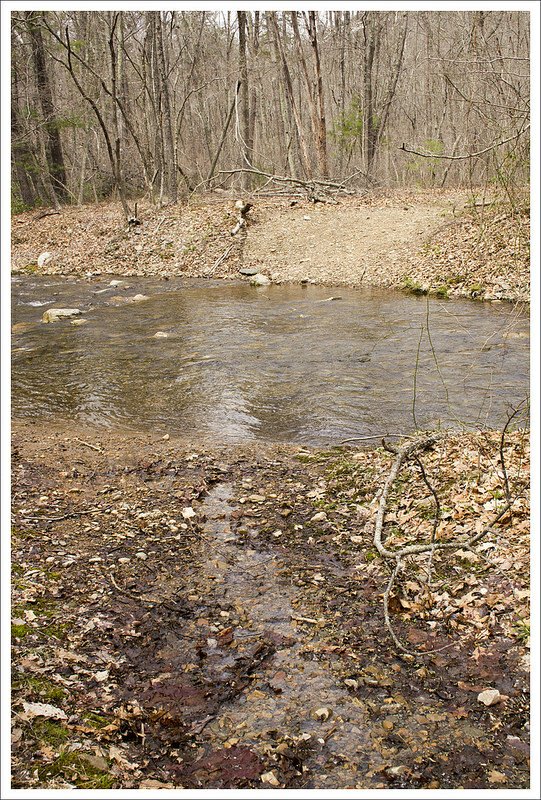 There were several stream crossings on this section of trail. All of them but the second crossing were easy. We found the stream wide and flush with water. Most of the stones people use to cross were underwater. Instead of trying to attempt the rock-hop, we took off our shoes and waded across. Refreshing! You get a nice view of Buzzard Rock before descending to Paine Run. 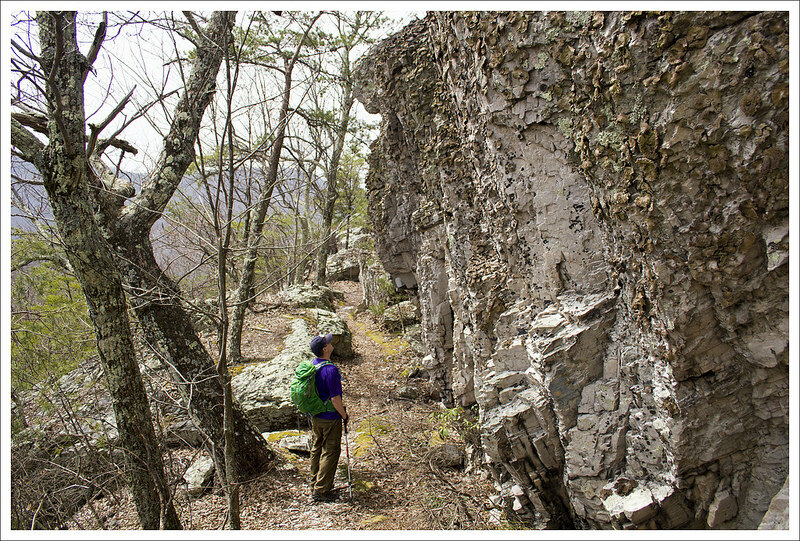 Below: Some interesting rock formations along the trail; Lunch stop; Glimpses of farm land. 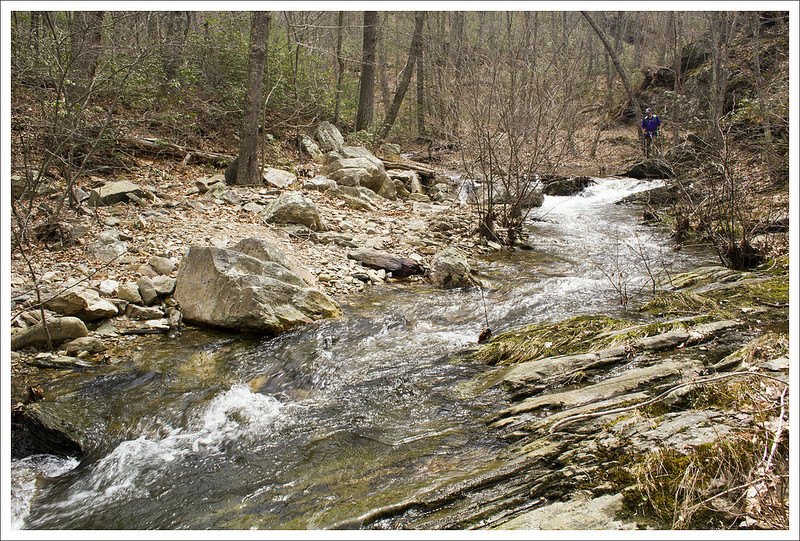 The Paine Run trail is very pleasant for a couple miles – sounds of running water and mountain views through the trees. When we hiked, the stream was flowing with lots of rapids and tiny waterfalls. I imagine it will run low and dry later in the summer. The path climbs so gradually you hardly notice you’re ascending! Eventually, you leave the streamside and head back toward Skyline Drive. After one final sharp switchback, you have one more moderately steep ascent back to your car. All in all, I was pleasantly surprised with both the views and streams on this route. We had a great time! MapMyHike said this hike is only 9.3 miles, but all other sources put it at 9.7-9.8… so who knows! 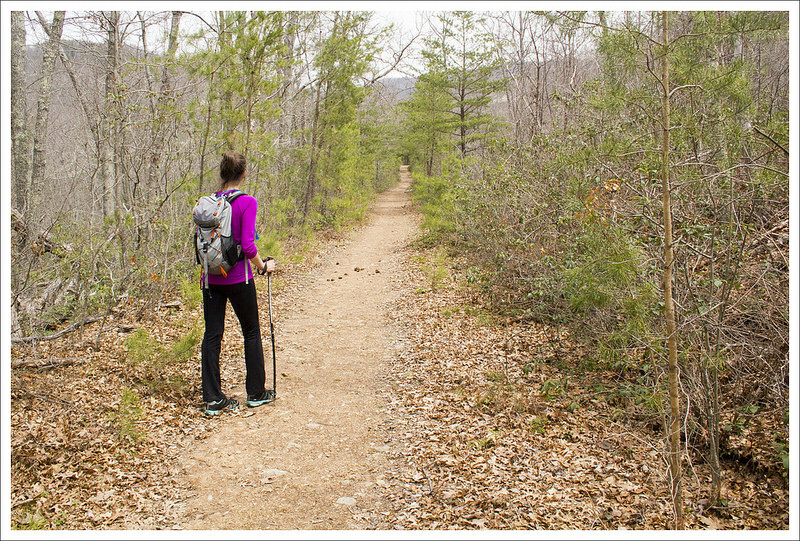 We feel like we have covered so much of Shenandoah National Park on our blog, but it seems there is always another trail or loop that you can try. We talked about a hike to Blackrock summit before in our coverage of an AT segment, but this is a longer loop version that offers a few additional views and a stream to enjoy. Other than the Blackrock summit, you will likely not see a lot of people on this trail. We only saw a few people the entire day, which was a little shocking for a beautiful weekend day that happened to also be a free National Park entry day. As Christine mentioned, you could skip the Blackrock summit trying to follow the signage, but you don’t want to miss the best part of the hike. When we hiked previously, our route bypassed the spur trail that leads to the Trayfoot Mountain Trail. This spur immediately gives you some additional views and some interesting rocks to scramble around. Most people that are doing an out-and-back just to the summit from the northern approach will miss this area also. Adam makes a first attempt to cross (with shoes). The second (successful) attempt was barefoot. 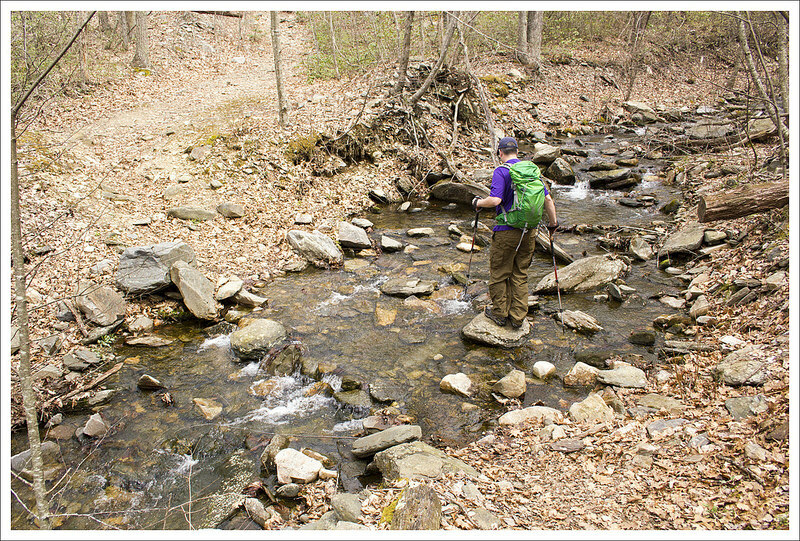 Below: Adam descending to Paine Run; The shoeless crossing attempt, The trail goes right through the middle of the stream. One thing that Christine and I both mentioned throughout the day is how this would make for a great overnight backpacking loop. If you choose to do so, I would tackle all of the tough uphill climbing the first night, making your way through the Trayfoot Mountain trail and camp somewhere near Paine Run. This will provide a great water source and there were some nice campsites near the water. The following day, you’ll just have a steady, but not too strenuous hike back uphill to your car. When we started walking the ridgeline of the Trayfoot Mountain trail, I felt like we stumbled across the best place I’ve ever seen to spot grouse. We encountered three along our walk. A couple of years ago, while hiking in Great Smoky Mountains National Park, we encountered our first grouse on a trail. The beating of its wings created a strange echoing syncopation in our chest which made us both wonder if our heartbeats were going haywire. Seeking sources online, we found it was a common sound for mating grouse. We actually spotted several on this trail and when they took off in flight, we could briefly hear that same noise that perplexed us before. What a relief to actually spot the culprits this time. Christine walks the wide, gradually ascending Paine Run Trail. 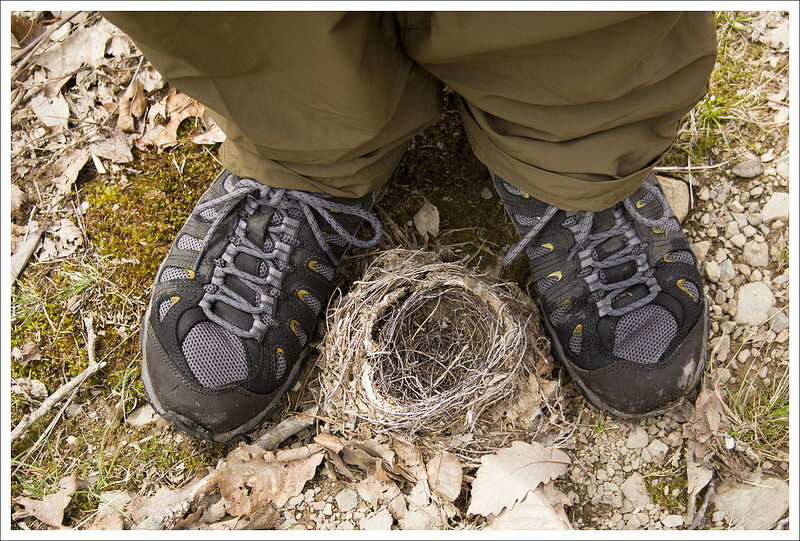 Below: We found several blown-down bird’s nests along the trail; Pretty Paine Run; Another stream crossing. Further along the Trayfoot Mountain Trail, we climbed up on a few rocks to enjoy our lunch and get some views. I managed to pick some rocks which were not in the least bit contoured to our bodies, which made for an uncomfortable sitting. It reminded me of how fast food chains design their seating area so the chairs are only comfortable for a short amount of time to prevent loitering. We quickly ate and moved on. Around the 4.0 mile marker, the ridge line ends at a nice rock outcropping which gives you some last views before descending towards Paine Run. Some local families like to park on the western outskirts of the park and hike up to this area for views. When we reached Paine Run, the water was a little high from the recent rains. There were a few places to rock-hop across. In one spot, we did have to shed our shoes to make our way across. Christine said I looked like a hobbit with my pantlegs pulled up halfway as I crossed. I responded back in my geekiest way, “May the hair on my toes never fall off.” I will say the water was very cold, but it felt so refreshing to my feet. The sensation of the freezing water made me feel as if I had just received a nice massage on my feet. After the refresher, I felt I could hike a lot longer. The Paine Run Trail is popular with horseback riders. Below: The final ascent to the parking area; We spotted a bear on the drive home; Before we went home, we stopped for famous Shenandoah blackberry ice cream. The stretch on the uphill Paine Run trail was very gradual. While some people may think this was more of a boring stretch, I enjoyed the views of Paine Run along the side. There were even a few very small waterfalls to enjoy since the water level was high. 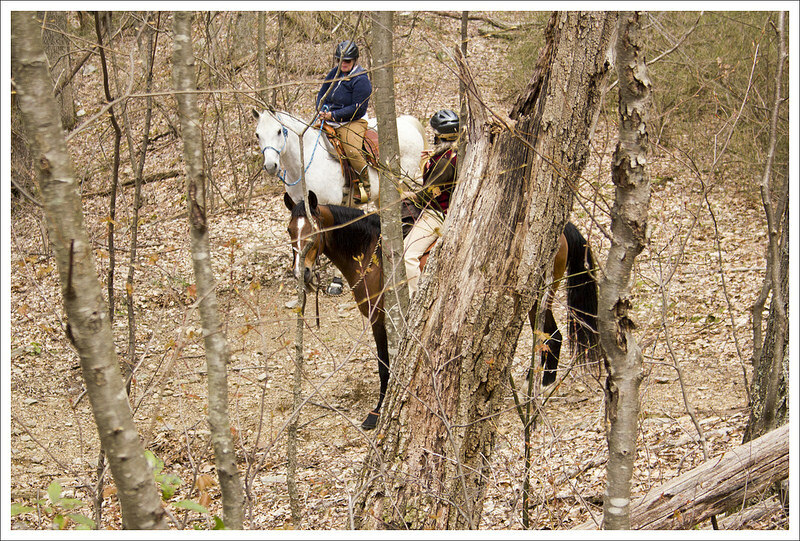 We also came across a group horseback riding along the trail. 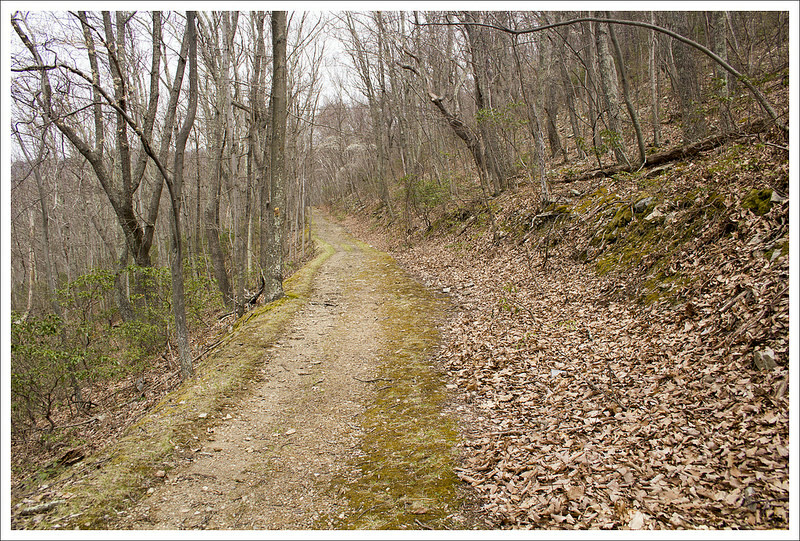 All yellow-blazed trails, like the Paine Run trail, in Shenandoah National Park allow horses on the trails. This would be a great trip to take down to the water and let the horses rest and get a drink before returning. We got back to our car and then heading north along Skyline Drive. Within a few miles, I spotted a young black bear on the side of the road. We were excited to have our first bear sighting of the year. 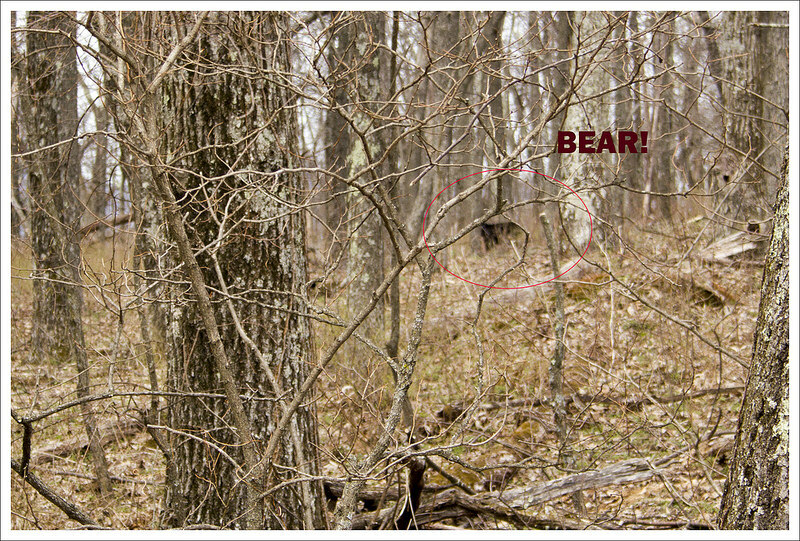 The bear quickly ran away once it knew it was spotted, but we hope we get to see many more this year. We stopped at the Loft Mountain wayside to get our first blackberry milkshake of the year. Appalachian Trail thru-hikers talk about these treats for days in advance of getting to Shenandoah and the hype is worth it. 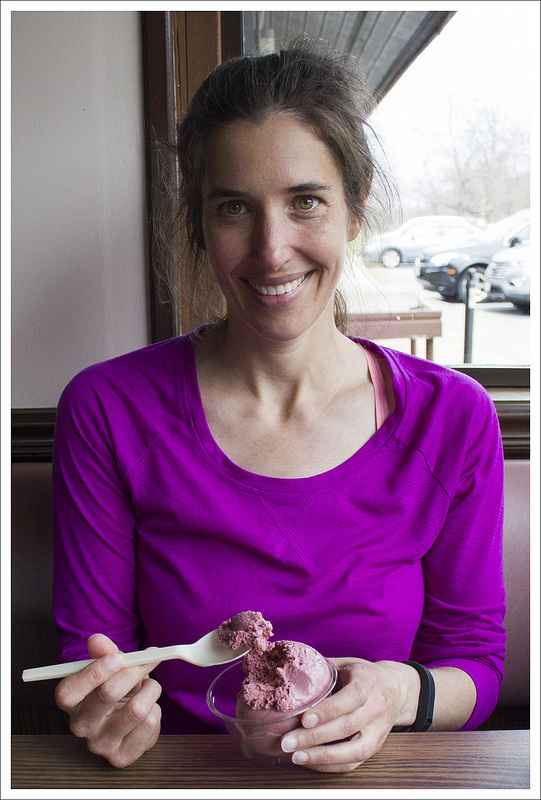 However, their milkshake machine was broken and we had to settle for blackberry ice cream. It was still a just reward for a long hike. While we realize this hike is longer and not as popular as some of the others in the park, this hike really has some nice gems along the trail. I was pleasantly surprised at what this had to offer! Elevation Change – About 2200 ft. Difficulty – 3.5. The climbs to Black Rock summit and Trayfoot Mountain can be a little steep, but the climb from Paine Run back to the parking area is very pleasant and gradual. The length adds to the difficulty rating of this hike. Trail Conditions – 4. The trail was clear and in great shape! Views – 5. The views from Black Rock summit are spectacular. 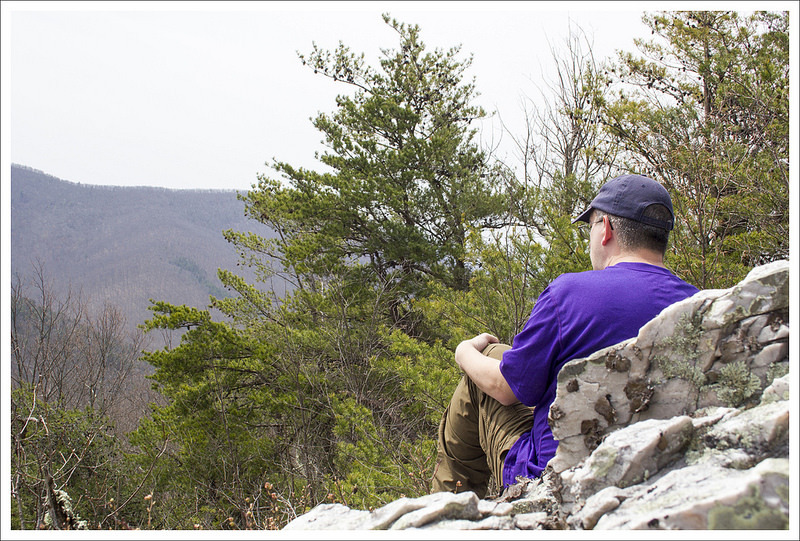 While the summit of Trayfoot Mountain has no view, there are other nice views from the Trayfoot Mountain trail – especially the outcropping that overlooks Buzzard Rock. Streams/Waterfalls – 3. Paine Run was surprisingly pretty and broad in the early spring. As we hiked up the Paine Run trail, we had many stream crossings and nice views of the water. Wildlife – 3. We saw deer and lots of grouse on the trail. We also saw a black bear shortly after leaving the parking area to come home! Ease to Navigate – 4. There are only a few, well-marked turns on this hike. Solitude – 4. We saw a few people near the stream that had come in from the western perimeter of the park, a few people on Black Rock Summit, and a trio of women on horses. All-in-all, we enjoyed a lot of solitude for a long stretch of trail on a pretty ‘free park entry’ day! 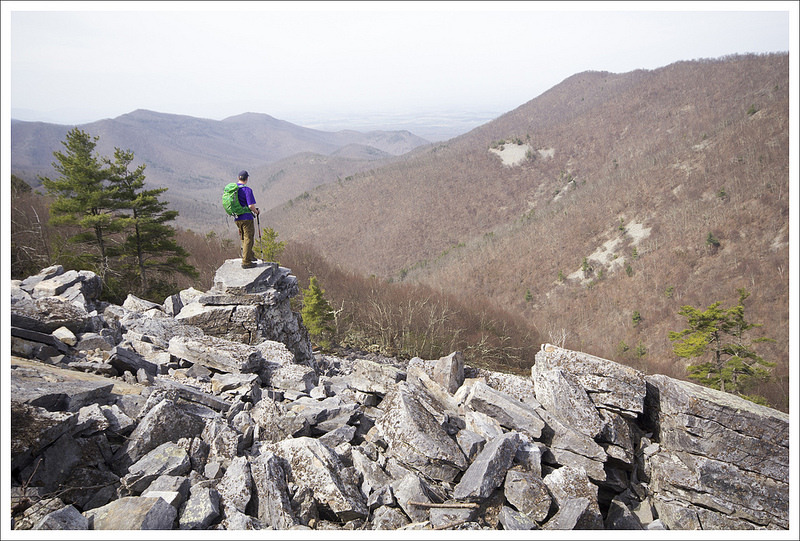 Directions to trailhead: Located in the Southern Section of Shenandoah National Park. Park at the Blackrock Gap parking lot around MM 87.3. 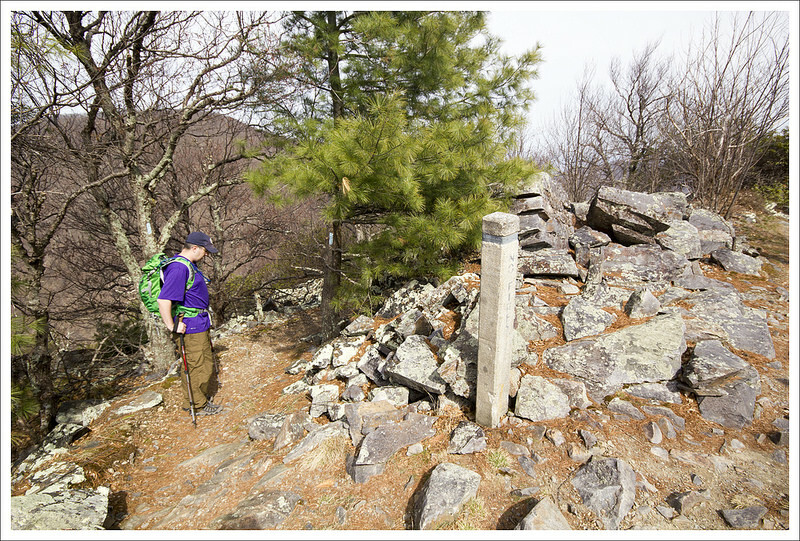 Cross the road and find the cement post for the Appalachian Trail. Take a left, heading north, to start your hike. I went with a group of friends and the view at Black Rock Summit was amazing. We were disappointed there was hardly in water on the Paine Run trail. That would have improved the hike but it was a well maintained enjoyable hike. Water is so low throughout the park this fall! Paine Run is pretty when it’s flowing. i hiked this loop today ,dropping down the Paine Run Trail first, heading up the Trayfoot Mt Trail, then to the Black Rock Spur Trail to Black Rocks, and finally South on the AT.This saves Black Rock for (almost) last and it was the climax of the hike. Lots of Mt Laurel and Columbines. A brief shower made conditions perfect for a rainbow as I descended Trayfoot heading to Black Rock.I had been in the area once before, but it was cold rain so the spectacular view was a welcome surprise. And other than a few folks at Black Rock, I had the place to myself all day. Despite recent trail maintenance, the Trayfoot trail had lots of tall grassy vegetation in abundance. A wonderful habitat for Lyme carrying ticks- so take precautions! Sounds like a great day on the trail! I really like the solitude in that part of the park. Awesome!! That camping spot sounds perfect! Thanks for your help. Hey guys! I’m planning on hiking this trail mid April with some friends! I’m curious if I need any permits to hike, camp or park? We’re taking our time so we’re planning on camping overnight. Was there any shelters along the way? Thanks for all your help, y’all do a fantastic job on all your hike descriptions! Hi Andrew! I actually did this loop as an overnighter last spring with a group of my girlfriends. To camp overnight, you will need a permit. They are free and available at all park entry stations. You just fill out a short form with your personal/route information and then attach the tag to one person in your party’s backpack. You don’t need a permit to day hike. This route takes you right by the Blackrock Hut (backcountry shelter). It’s about .2 miles off the AT on a spur trail. The problem is that you’ll pass it in the first mile or two of hiking. You probably won’t be ready to camp this early in your hike. And honestly, the best campsite is down along Paine Run. There is a large, flat, open space right after the main stream crossing. We put two tents there, but there was easily space for a couple more tents. Access to water is reliable and the stream is a nice place to swim/wade. This campsite is a little over the midpoint of the loop. I’m fairly new to hiking, I’ve only been doing it for a few months as part of an effort to get more active and enjoy life a little more. 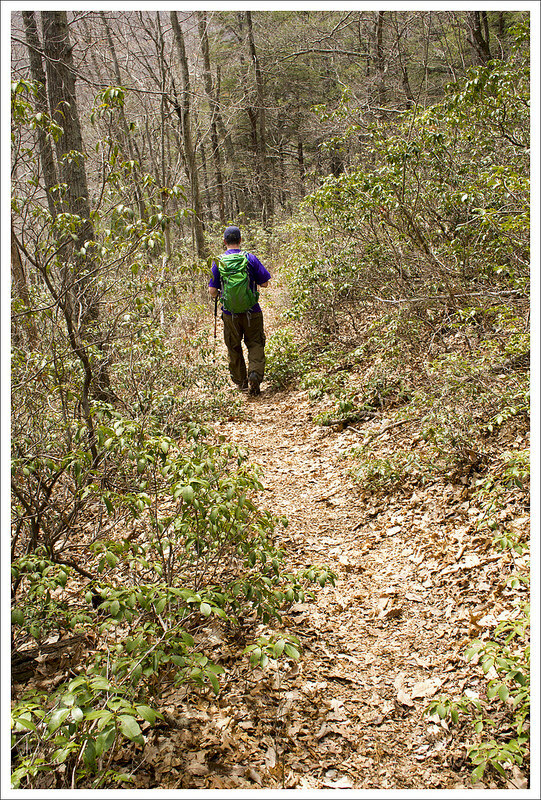 Your website is wonderfully useful to a novice Virginia hiker. I’m going to seek out some of these hikes and will probably do this one in particular next weekend. Thanks for the visit! 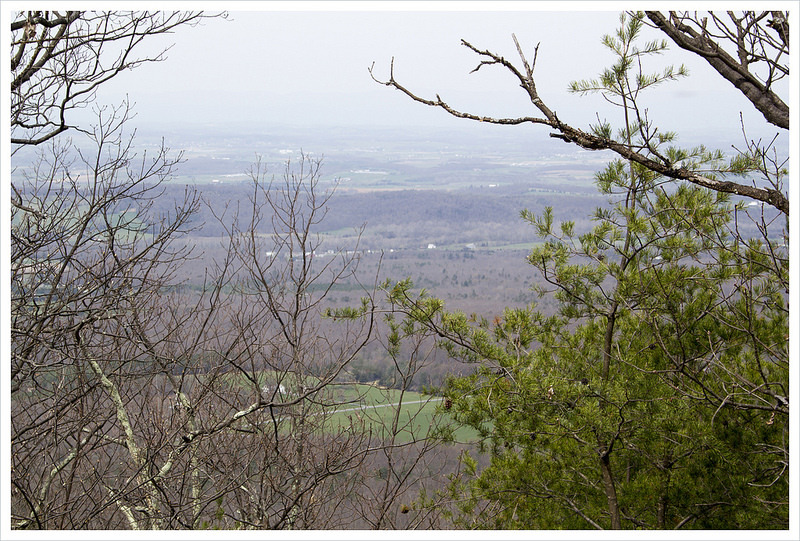 Enjoy the hike… you should have nice views with the leafless trees. Like that hike a lot. Nice job documenting your trip. The grouse do kind of induce a heart attack, don’t they? Another nice description, as always. This has always been a go-to early season get-in-hiking-shape hike for me when the Drive is still closed, though I don’t do it every year. I usually start from the “local family” location you mention and head up Trayfoot – definitely front-loading the elevation gain. But you can only park there on weekends, as school buses need the lot to turn around in during the week. A couple of interesting points – did you know there used to be a resort about 80% of the way up the Paine Run Trail back in the late 1800’s? You can see the old road to the place if you look carefully during the climb. And I wondered for years why that concrete post is at the summit of Trayfoot, as the park usually puts mileage posts at trail intersections. A friend gave me a 1973 edition PATC map and I discovered that the post is at the end of the old fire road. Interesting insights Jeff. I always enjoy learning about the history of some of these trails and area.